This luxury, action-packed 15 night holiday to California and Hawaii will take you from the rolling vineyards of Napa Valley to the urban hub of San Francisco and beyond to the dramatic volcanic peaks of Hawaii – all with the perfect balance of sun-filled relaxation and thrilling experiences. 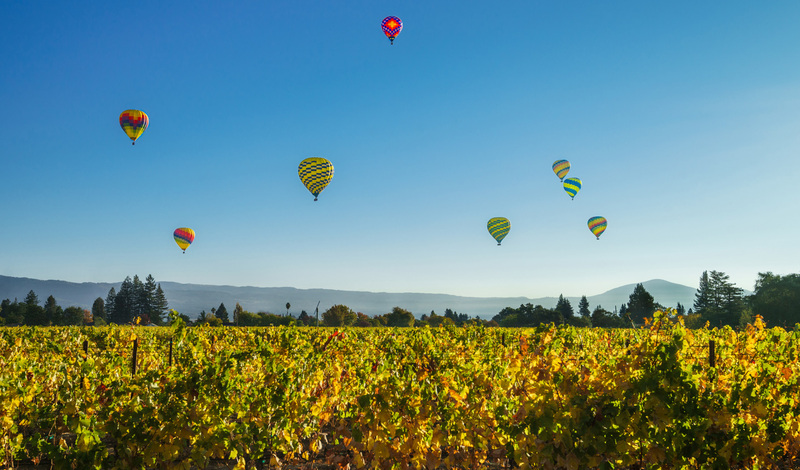 Our travel experts have tried and tested a host of experiences that we think you’ll love, from hot air ballooning over Napa Valley wineries at sunrise, to moonlit treks in Yosemite, as well as helicopter flights over Hawaii’s active volcanoes. This thrilling getaway will see you sampling the finest wines and exploring all kinds of natural wonders and city hot spots as you work your way around the California coastline and island hop through Hawaii. First, we’ll fly you to San Francisco, where on arrival you can pick up the hire car and head off on the hour and a half drive up to Napa Valley. Calistoga Ranch will be your resting spot. Nestled amongst towering and fragrant pines, the 157 acres will give you pristine views and peace of mind. After settling in, head off on the Kunde tour to sample some of the valley’s finest wines and local cheese – all whilst enjoying the heavenly hilltop sunset. Take a stroll through the vineyards and see first-hand how the wine goes from grape to bottle – your personal guide will make sure you feel fully at home. Head back to the Ranch to rest your head; an early start awaits. A few hours before sunrise, jump out of bed and be treated to a pre-dawn snack of coffee, fruit juice and melt-in-the-mouth buttery pastries before being taken to the launch site. The hum of the inflation fans, lively balloon colours and roar of the burners are bound to get you excited for your sunrise flight over Napa Valley. Watch as the rising sun glistens over the stunning pine laden valleys below, take a deep breath and soak up the unforgettable nature of this remarkable view. Before you have the chance to notice your rumbling stomachs, you will be treated to a full breakfast and bottomless mimosas from Domaine Chandon. Don’t forget to take a dip in one of the spa’s mineral pools before you leave, a must do before your next destination. Set off on the four-hour journey to your resting place for the next three nights, The Ahwahnee Lodge in Yosemite. Here the rustic but elegant architecture combines with the spectacular views to make it the perfect bolt-hole for you to sit back and relax. Yosemite is the crowning glory when it comes to spectacular scenery, rich history and captivating terrain for as far as the eye can see. Located in the High Sierras, Yosemite is nature in all its shining glory. From the towering granite carved out by glaciers, to the ethereal and therapeutic silence, soak up your surroundings as you spend the next few days with your Black Tomato guide hiking up to the glacier and exploring the night skies on a private moonlit tour. It’s off to the bustling city, so speed back to San Francisco, dump your bags at the St Regis and get ready for a day of exploring. Alcatraz has to be one of the most iconic parts of San Francisco – take a night tour, it’s an unforgettable experience. Jump aboard your personal narrated boat trip around the island before you land on the dock and start the “Doing Time” experience. Now enjoy the sunset with breath-taking views over the main city as night falls. The next day take San Francisco by storm on an electric bike tour. Starting at Fisherman’s Wharf you’ll head along the waterfront to Fort Point before crossing over the Golden Gate Bridge. Soak up this iconic location as you breeze through, finishing in Sausalito where you can browse the shops of the tree-lined streets or sample some of the fresh seafood in the afternoon sun. Either head back to rest your weary limbs by the ferry or keep on pedalling until sunset. To finish off your last day in the Golden City, relax in the hotel spa before heading out to catch a tram and explore like a true local. The perfect end to your stay, sample delights from Chinatown and set your taste buds tingling with everything from Dim Sum to herbal teas. Look out for authentic cookware and local musical instruments to really dive into the Chinatown culture. Now pack your bags and get ready, you’re off to the sandy shores of Hawaii. A five and a half hour flight and you’re in the tropical paradise of Hawaii. After sampling the crystal-clear waters and white sandy shores of the Hualalai, Four Seasons awaits. Hawaii’s Volcanoes National Park is one of the most breath-taking places to see live lava flow, so on your first day head out on a private helicopter tour. Soar over the peaks and look into the bubbling craters below (you won’t forget this). Spend the rest of the day relaxing, catching some sun or taking a dip in the azure sea before you return back to the volcano on foot. Your infinitely wise guide will show you up to the steams and under a lava tube – wait until the sun starts to set and you will see the lava emit a glorious glow. Spend the next few days swimming in one of the five hotel pools or taking a trip (or two) to the spa. Before you head to the last stop on your adventure, take a sunset cruise up the Kohala Coast. Sit back and sip your drink, listening to the dulcet tones of Captain Steve’s endless tales and watching the colours of the sinking sun shimmer off the water. It’s then off to your last stop, the Princeville Resort in Kauai (more remote and laid back than any other island) whose beautiful scenery will quite simply blow you away. Go explore the clearest lakes, rainforests and softest sands before an evening celebrating Polynesia’s rich history and culture. After tasting all the local delights, allow your senses to be ignited while watching flamethrowers in the local Kauai fire show. For the next day, master the waves in true Hawaiian style with surf lessons from the pro himself. We’re sure the local Titus technique will have you up and riding those waves in no time. For one last adventure before you head home (we’ve saved the best till last), step into a private helicopter and let your journey begin with a flight to the spectacular Hanapepe Valley before continuing on to the “Jurassic Park Falls” and up the Olokele Canyon and Waimea Canyon (the famed “Grand Canyon of the Pacific”) where you’ll explore many hidden waterfalls. Weather permitting, we’ll visit Mt Waialeale, the heart of the ancient volcano. This is the wettest spot on earth, and you’ll be flying into the centre of a crater with 5000-foot walls towering above and 3000-foot waterfalls surrounding you. This will be a truly awe-inspiring finish to your ECO Adventure over the Garden Isle. After a short drive back to the airport, it’s time for you to head home and share all the amazing memories of your trip. That is, if anyone is willing to listen – we know they’ll be just as jealous as we are.